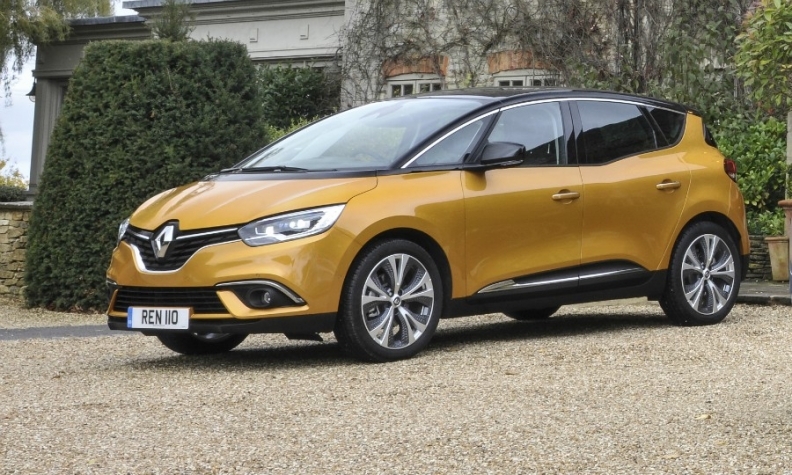 Renault is offering the Scenic minivan, shown, with a 48-volt mild hybrid drive from Continental that produces just 92g/km of CO2. The rapid uptake of vehicles equipped with 48-volt mild hybrids, which suppliers and analysts predict will rise into the multimillions by 2020, is well underway in Europe. Renault is offering a version of its popular Scenic compact minivan with the affordable, fuel-saving system in Europe this year and Volkswagen Group plans to use 48-volt hybrid drivetrains in its cars instead of small diesel engines, starting with an upcoming Golf-sized model. The switch is taking place because costly after-treatment systems will be needed to make diesels comply with tougher emissions regulations. "The added cost is anything from 600 to 800 euros in material costs just for the after-treatment system," Frank Welsch, VW brand's head of r&d, told the UK's Autocar magazine. "To add a diesel in the Polo, it is 25 percent of the car itself." The added cost is making automakers think twice about offering diesels in the subcompact and compact sectors, as is consumer backlash against the powertrain following VW Group's emissions-cheating scandal. In addition, a number of European cities are considering banning diesels from city centers. These setbacks hurt automakers because they were heavily relying on diesels to help them comply with tougher European emissions standards. Starting in 2021, combined CO2 emissions from automakers in Europe will need to be 95 grams per kilometer, down from 119.5g/km in 2015. Adopting 48-volt systems will become "the only way to replace diesel's base 15 to 20 percent fuel-efficiency advantage over gasoline," analysts ISI Evercore said in a recent report. That is why Continental, which teamed up with Schaeffler on the 48-volt system in the Scenic, anticipates that 4 million vehicles with the low-voltage hybrid drive will be produced worldwide in 2020. The German supplier, which will compete with Delphi, Valeo, BorgWarner and others for leadership in the sector, expects output of vehicles with mild hybrids to rise to 25 million globally by 2030. That same year, PwC anticipates the technology will be in 29 percent of all new vehicle registrations in Europe, up from just 1 percent this year. "We see the mild hybrid technology as one of the best options particularly in the short to midterm," said Christoph Stuermer, who is global lead analyst at PwC's Autofacts unit. Mild hybrids are the "next generation of personal mobility" and offer a stepping stone on the way to EVs, Stuermer added. For many observers, the technology is an economical go-between on the road to offering full-electric cars, which are still too expensive for most consumers. While Continental and Schaeffler's first serial production 48-volt hybrid is mated to a diesel, the suppliers say that the technology will also be applied to gasoline engines, where it estimates that adding the system can reduce CO2 by up to 20 percent. By comparison, adding a 48-volt hybrid to a diesel improves fuel efficiency by 5 percent to 10 percent, the suppliers said. Renault's fuel economy numbers support this as the Scenic with the 48-volt hybrid uses 3.5 liters of fuel per 100 kilometers and has CO2 emissions of 92g/km while the diesel without the mild hybrid consumes 3.9l/100km and emits 100g/km of CO2. Most importantly, however, is that the Scenic with the mild hybrid costs about 1,160 euros more than the diesel equivalent model without it. When asked how much of a price premium automakers are willing to pay to get better fuel economy, Continental's powertrain boss, Jose Avila, said it is roughly 50 euros per gram of CO2 savings.